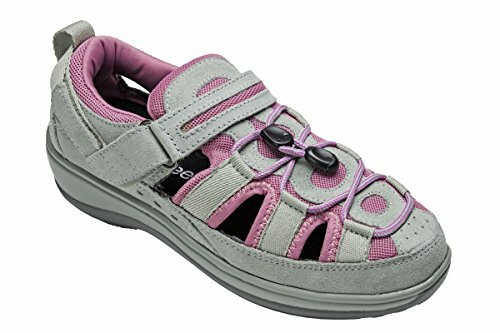 Orthofeet Naples Comfort Orthopedic Diabetic Plantar Fasciitis Womens Sandal Fisherman Gray Leather 9.5 M US by Orthofeet at Lamont Design. MPN: 883M095. Hurry! Limited time offer. Offer valid only while supplies last. Orthofeet Naples Women's Fisherman sandals offer anatomical arch support, non-binding relaxed fit, and maximum protection against pressure points. Orthofeet Naples Women's Fisherman sandals offer anatomical arch support, non-binding relaxed fit, and maximum protection against pressure points. The Gel orthotic-insole along with the ergonomic, cushioning sole soften step, enhance stability, and facilitate natural foot motion. The deep toe box design allows the foot to relax and spread out naturally for added comfort. Using its biomechanical expertise Orthofeet has been dedicated to designing Naples as the best comfort Fisherman sandals and the best walking Fisherman sandals for sensitive feet, including the best diabetic Fisherman sandals, the best orthopedic Fisherman sandals, the best therapeutic Fisherman sandals, the best arthritis Fisherman shoes, the best wide Fisherman shoes, and the best extra wide Fisherman sandals. Naples Women's Fisherman sandals are engineered to help reduce Foot Pain, Heel Pain, Arch Pain, Knee Pain, Forefoot Pain, Metatarsal Pain, Low Back Pain, and to enhance comfort for Diabetic Feet, Arthritic Feet, Sensitive Feet, Plantar Fasciitis, Pronation, Metatarsalgia, Morton's Neuroma, Bunions, Corns, Hammer Toes. Best design for following footwear categories: women's comfortable Fisherman sandals, women's arch support Fisherman sandals, women's Fisherman sandals for neuropathy, women's orthopedic Fisherman sandals, women's orthotic Fisherman sandals, women's therapeutic Fisherman sandals, women's arthritis Fisherman sandals, women's wide Fisherman shoes, women's extra wide Fisherman shoes, women's extra wide Fisherman shoes, women's heel pain Fisherman shoes, women's plantar fasciitis sandals.